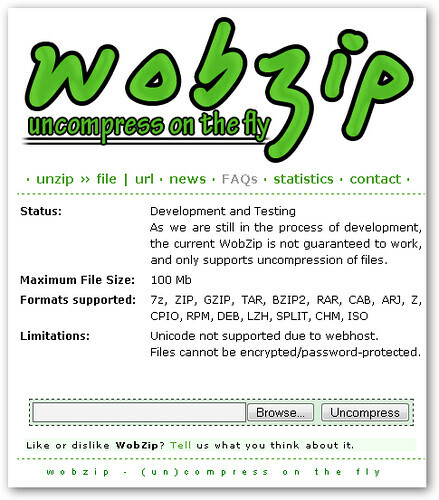 Wobzip takes some of the hassle out of working with compressed ZIP and RAR files if you don't deal with them frequently by letting you uncompress them through your browser. To use the web-based extraction utility, just specify the location of your file either on your desktop or on the web and click the Uncompress button. The maximum file size Wobzip can handle is 100MB, and less popular file formats including 7z, CAB, ARJ, Z, GZIP, and TAR are also supported. I can definitely see Wobzip being very useful if you just need to quickly uncompress a file and don't happen to have WinZIP or some other utility around, but it looks more like a nice proof-of-concept than something you can really rely on (it even says so on the page).